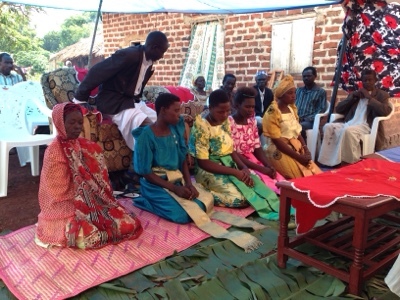 Here in Uganda there is a ceremony when the groom-to-be is officially introduced to the family of the bride-to-be. The man is expected to bring many gifts to the family, and eventually after some negotiations, the father of the bride or a male representative signs a contract with his father or male representative giving her to them. It is a very interesting ceremony. We attended our first introduction ceremony last weekend. Since we know the groom well, he asked us to drive him and some of his representatives. We were supposed to pick him up at 10am to reach the family of the bride by 11am, but I know enough about Ugandan culture to know that was not going to happen. At 10am we received a phone call that we should not come yet. Since this is a traditional ceremony, and we were traveling with the groom, we needed to wear traditional clothes. 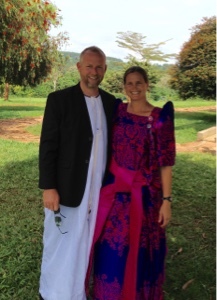 Here is a photo of me in my gomez and David wearing his kanzu. A few hours later we were called to go pick up the groom and his entourage. 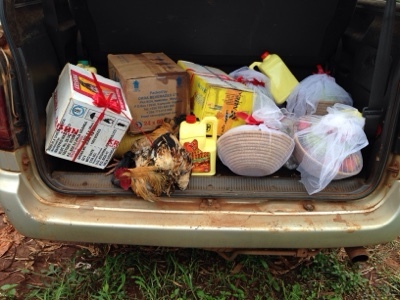 We packed in all the gifts including clothes for the family members, a huge bag of salt, a 50kg bag of sugar, boxes of soap, a chicken, cooking oil, baskets of vegetables and various other items. One of the most important things is the envelopes of money for various family members. Here is a photo of some of the items in our trunk. The ceremony is very serious, but it is a little funny. It was all in Luganda, but this is some of what I was able to understand. The visitors are seated then various members of the bride's family are brought to be asked if they know these visitors. They all answer "no" and are given money for their "transportation" expense. Eventually an aunt is asked if she knows the visitors and she answers that she does not have enough money to know these visitors. An envelope is passed, she goes back into the house, apparently to decide if the envelope contains enough money to "know the visitors." She came back and suddenly knew us. ;) Here is a photo of some of the family members. You might notice that all the women are kneeling and the men are sitting this is the case for the whole ceremony. And when we visitors finally met the rest of the family, we women always kneel before the man we are greeting. It is a difficult custom for me to adopt, but I went along with it for the sake of cultural sensitivity. When the agreement was reached between the families, the bride was brought out. Of course she also knelt before the family of the groom. Once all of the greeting of each family member and the contract was signed, we all shared a meal. Of course this was lunch at about 4pm, so I was feeling pretty hungry. Once the meal was over, we prepared to return to the house of the groom where there was a big party awaiting. 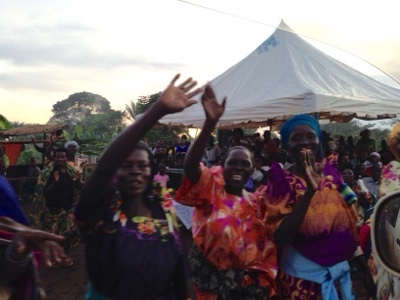 Most of the village seemed to be there to celebrate. There was another meal, music dancing, and so many people! The party went late into the night. We know because even after we left we could still hear the music. We enjoyed this day of culture learning. It is interesting how this experience gives me a picture of some of the biblical references to marriage and betrothal. We also enjoyed the opportunity to build relationships with more of our Ugandan friends. For some reason, wearing their traditional clothes, going to an introduction and speaking Luganda have opened doors and relationships. One woman said to me, "Now we can really see the love of God in your heart because you are together with us." I am thankful for this opportunity to communicate the love of Jesus simply by giving a day to be with our Ugandan friends. Many of those who were with us that day, do not yet know Jesus as their Lord and Saviour. We praise God that recently one of these friends has come to faith in Jesus Christ! We are praying that God would continue the work he has begun in the hearts of many others. Jesus has purchased his bride with much more than chickens or goats. He purchased us at the cost of his life. We look forward to the day when He will come back for his Bride. There will be a huge celebration on that day, the marriage supper of the Lamb!